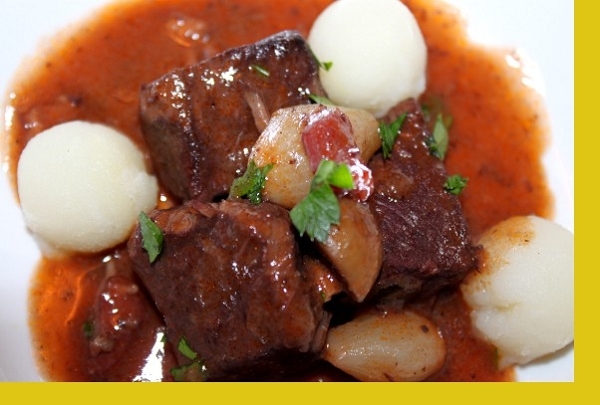 Described by Julia Childs as "one of the most delicious beef dishes concocted by man," this slow roasted beef braised in red Burgundy wine and flavored with garlic, onions and bouquet garni come together with pearl onions and mushrooms to make a divine dinner! 1. Heat a sauce pan on medium heat. 2. Empty contents into sauce pan. 3. Heat thoroughly until warm. This was delicious. Julia Child would be proud. 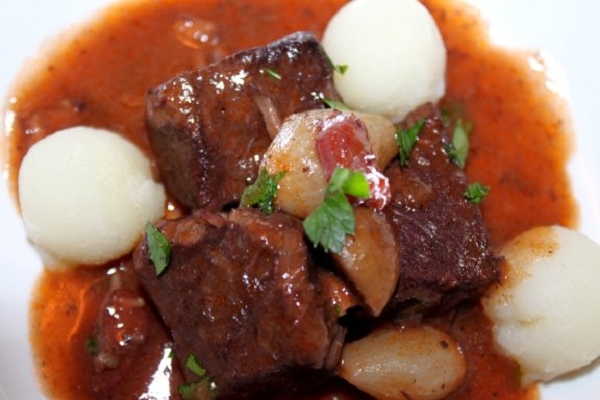 I have dined in famous Paris restaurants many times, and can assure you that Maria's Beef Bourguignon can comfortably compete with them on this meal. The meat is so tender and the sauce is just excellent! This dish was perfectly delicious. I loved it. Have always loved this dish and it was wonderful! So flavorful and the meat was fork tender. I would definitely order this again! This tastes just like the dish I had in Paris. Amazing flavors, meat just melted in my mouth, the seasonings were perfectly blended. This is a keeper.